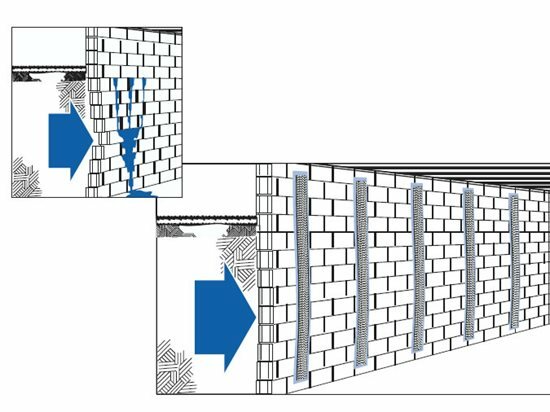 A carbon-fiber-reinforced grid system permanently stabilizes bowed foundation walls with minimal disruption and no excavation. Unstable soils are a basements worst enemy, whether the antagonists are expansive clay or compressible or improperly compacted fill. They launch a sneak attack by leaving foundations unevenly supported, triggering settlement and cracking. They can also barrage basement walls with lateral loads, causing walls to bow inward. As many homeowners can attest, the battle scars from all of this damage can be devastating to real estate values. Fortunately, it's possible to rescue settled foundations by using hydraulically driven piles or piers. But what about those bowed and/or cracked walls? How do you repair bowed basement walls and salvage their structural strength? 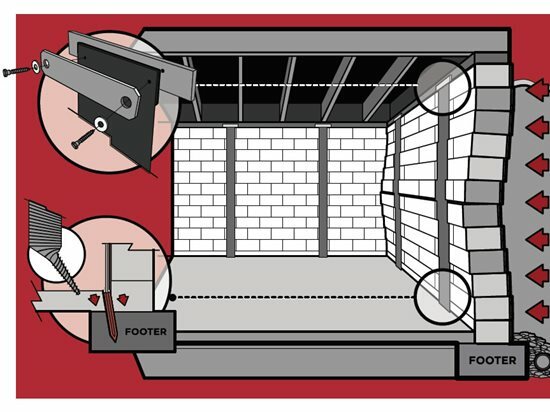 How do you prevent further movement without turning the basement into a war zone of steel support beams? Depending on the situation, these 3 methods can be used independently or in combination. 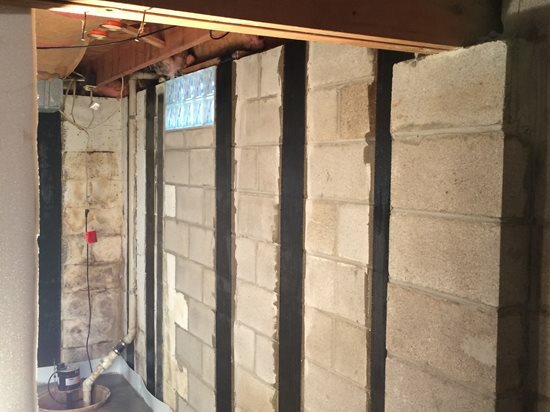 Countersunk staples and epoxy injection were used to repair this cracked basement wall. 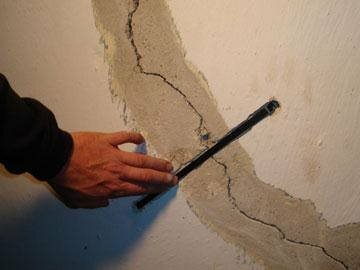 Cracked walls that are repaired with only injected material may suffer from long-term creep and fatigue causing failure over time due to foundation movement. By cross-stitching concrete crack repairs with staples, this creep is eliminated and the long-term performance of the repair material improves. The staples are made of high-tensile-strength carbon fibers encapsulated in a thermal-set resin and cured under pressure during manufacturing. A peel-ply fabric is adhered to the staples, and when removed, it leaves a prepared bonding surface ready for adhesion to a prepared substrate. A manual vacuum lamination process ensures a void-free bond of the staples on severely deflected walls. The typical staple is 10 inches long by 0.38-inch wide, with 1-inch legs. The staples can be used with various crack repair materials, including carbon fiber straps, and add little additional cost to the entire crack repair. According to Luke Secrest of Rhino Carbon Fiber, staples can also be used for driveways, pools poured foundations and many other concrete repairs. "It ensures that the crack will no longer grow and ties the separated pieces of concrete back together," he states. See staples used to fix a driveway. Luke Secrest of Rhino Carbon Fiber demonstrates how to easily repair a damaged basement wall using carbon-fiber straps that attach to the sill plate and footer. A big advantage of using an externally applied, carbon-fiber reinforcement grid system is the speed and ease of installation. It permanently stabilizes bowed foundation walls with minimal disruption, no excavation, can be used in lieu of tiebacks, and is much cleaner than alternative techniques. Installers apply the crack repair epoxy through a static mixer, so no measuring or mixing is required. Once the epoxy cures (generally after 1 hour depending on temperature), the process is complete. Be aware that not all carbon-fiber systems are installed the same way: some do not attach to the sill plate or floor and others have a necktie that attaches to the sill plate, but the strongest systems link the foundation base with the house framing. This is done by using a galvanized sill plate tie as well as a pin anchored into the footer. “In order to achieve the maximum benefit of carbon fiber, it needs to be properly connected to the structure’s foundation. It is necessary to attach the carbon fiber to the structures footer and to the sill plate. By tying the carbon fiber into the structure at multiple points, the stress placed on the foundation is evenly distributed. It is unsafe to only strengthen the wall at the point where it is bowed the most because you are shifting the stress load to a different part of the foundation; this causes the wall to shear at the bottom or collapse inward as a whole,” says Luke Secrest of Rhino Carbon Fiber Wall Supports. It is guaranteed to permanently stabilize foundation walls against lateral loads. Installation is fast with minimal disruption and mess. No excavation of property is necessary. It does not create obstructions in the room that can reduce floor space. The reinforcing material will not corrode, mildew, or weaken over time. The repaired surface can be painted or covered with white wall panels. The home maintains a higher resale value than when repaired with more obtrusive steel alternatives. A carbon fiber repair that is properly linked to the foundation and house framing comes with peace of mind that there will be no further damage. “Carbon fiber crack repair is a 12" wide repair that not only stops water infiltration but strengthens the foundation, preventing future cracks from developing. The repair is wide enough that it covers the main crack as well as any fractures or hairline cracks. This is important because what may be a hairline crack inside the basement is typically a much wider crack on the exterior,” explains Luke Secrest of Rhino Carbon Fiber. Helical ties can be used in conjunction with carbon fiber reinforcement to further the repair by relieving the external pressure on the wall and in cases of moderate to severe movement. See Using Helical Ties to Fix Bowed Basement Walls for more information. WHAT DOES IT COST TO REPAIR BOWED BASEMENT WALLS? The cost of foundation wall repair can vary widely depending on the extent of the damage and the materials and methods used. Homeowners should obtain several evaluations and estimates from reputable contractors and compare long-term value, not just installation costs.